Mystery at the Mansion Video Slot Guide & Review - Casino Answers! Mystery at the Mansion is a 5-reel, 25-line video slot developed by Net Entertainment, featuring a wild symbol, scatter wins, multipliers, a free spins feature and a bonus game. You can play the Mystery at the Mansion video slot at Bovada. Coin values on the Mystery at the Mansion slot machine are $0.01, $0.02, $0.05, $0.10 and $0.20. You can select from 1-25 paylines and play 1-4 coins per line. You can bet anywhere from a penny up to the maximum total bet of $20 per spin. Mystery at the Mansion has a low betting range that should be ideal for casual players. You can manually skill stop the reels by pressing the Spin button in the middle of a spin. To play the Mystery at the Mansion video slot, select your bet and press the Spin button. Alternatively, you may use the “Max Bet” button to play all 25 lines at 4 coins per line. The highest paying symbol on the Mystery at the Mansion online slot is the Detective symbol. If you hit 5 Detective symbols on a selected payline, you will win the 7500 coin top jackpot. The Detective symbol is wild and will substitute for all symbols except for scatter and bonus symbols. Mystery at the Mansion’s scatter symbol is the Mansion symbol. 2, 3, 4 or 5 Scattered Mansion symbols will pay out 2X, 4X, 50X or 400X your total bet. 3, 4 or 5 symbols will also win you 10, 20 or 30 free spins with a 3X multiplier. Wins are tripled during the free spins feature (except for free spins or bonus game prizes). 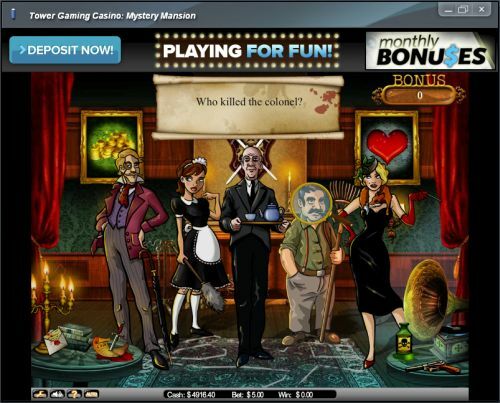 You can win a lot of money in the Mystery at the Mansion free spins feature when you play at Bovada! Payouts are displayed on the Paytable. Only the highest win on an enabled payline is paid. Combinations win only if in succession from left to right, except scatter symbols. Mystery at the Mansion has an autoplay mode that can be opened up by hitting the “Auto” button. You can play 10, 25, 50, 75, 100, 250, 500, 750 or 1000 autoplay spins at a time. In the advanced settings, you can set Excalibur autoplay mode to stop on any win, if free spins is triggered, if the jackpot is won, if a single win exceeds (any amount you input) and if cash increases/decreases by (any amount you input). You can stop the autoplay mode at anytime on the Mystery at the Mansion online slot. 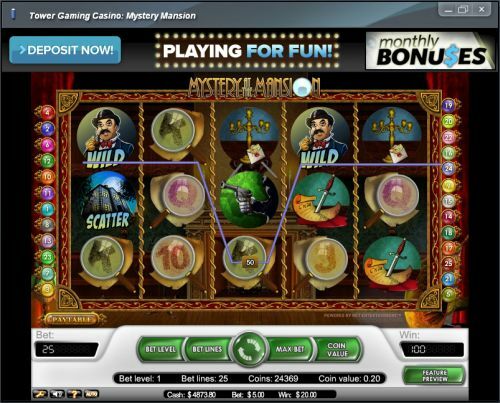 If you are interested in mysteries, you will enjoy the theme of the Mystery at the Mansion video slot. Even if you are not into mysteries, this video slot still has good presentation, a free spins feature, a bonus game and a very good top payout! To play Mystery at the Mansion, you can sign up at Bovada! Can players from the United States play the Mystery Mansion slot game for real money? No, American players cannot play Mystery at the Mansion for real money at this time. For an alternative, we recommend that you read our review of the Sherlock Holmes inspired London Inspector Video Slot or play the video slot at Bovada. Can I play a flash game of Mystery at the Mansion in my browser? Yes, you can play a flash game of Mystery at the Mansion for free or real money at Bovada. If you experience any issues with the flash casino, make sure you have the newest version of Adobe Flash Player.